Interview with G.P. Tregubov, Head of the Federal Agency of Science at the Ministry of Education and Science of the Russian Federation "Innovation Problems of Modernization of Industrial Environment for the Science Intensive Products Market". Vasilyev V.A. et al. Theory and Technology of Casting Manufacture by the RP Method. Gladkov V.I. et al. The Rapid Prototyping Technology in the Automobile Industry. Birbrayer R.A. et al. Rapid Prototyping Technology in Modern Precision Casting Production. Vasenov A.V. et al. 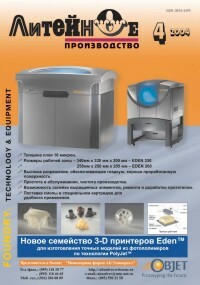 Information Basis for Introducing Rapid Prototyping Technologies. Vasilyev F.V. What Is the Rapid Prototyping Technology Needed For? Boyarintsev A.V. AB Universal's Projects in the Foundry Tooling Manufacture. Vasilyev F.V. Automating the Process of Pattern Preparation for Rapid Prototyping. Yatsyk S.I. et al. Accelerated Sand Mold and Core Making. Sukharev M.G. et al. Accelerated Production of Pilot Lots of Castings. Kulagin V.V. Rapid Prototyping and Titanium Casting in Implantology. Shayukov S.A. The International EUROMOLD-2003 Exhibition (Frankfurt-on-Main). Ishchenko V.V. et al. Registration-and-Technical Desk-Top Complex for Small-Lot Casting Production. Leushnikov A.V. et al. Outsourcing Rapid Prototyping and Forming Tool Making Services. Degtyarenko G.I. Pattern-Free Production of Large Sand Molds Using Robots.